Santander Puerto Rico collected more than 1,700 pairs of jeans to be donated to the island's homeless population. Santander Puerto Rico collected more than 1,700 pairs of jeans to be donated to the island’s homeless population. 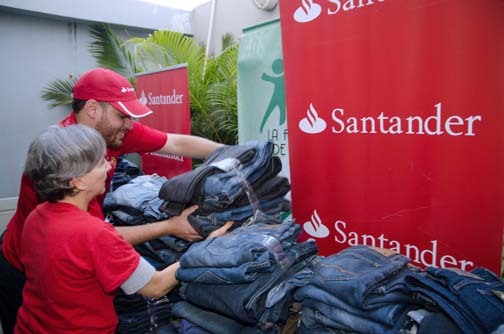 Through its community impact program “Santander Solidario,” Banco Santander Puerto Rico collected more than 1,700 jeans and 3,000 personal hygiene items that will be donated to various nonprofit organizations that provide services to the homeless population around the island. The announcement was made recently during the donation to La Fondita de Jesús, one of the institutions benefited by this effort. For Díaz, the initiative was also an opportunity to raise awareness among employees, family and friends about the situation of the homeless in Puerto Rico. According to the latest Homeless Count, conducted in 2015 by the Family Department as a requirement of the U.S. Department of Housing, a total of 4,518 homeless people were identified on the island. The highest proportion of individuals were men 24 and older. In 2013, the number of homeless was 4,128, which represented an increase of 390 people over a two-year period, she said. Santander was joined by students from the Colegio San José in Río Piedras, which collected 160 jeans and more than 100 personal hygiene items in a week, Díaz said. Hey Buddy!, I found this information for you: "Santander donates collected clothing, items to homeless". Here is the website link: https://newsismybusiness.com/santander-collected-homeless/. Thank you.